dinner ware dominating today's market. It is interesting to see how the Doulton collector approaches his or her passion. Firstly we must understand that the word 'passion' is not lightly applied. Many collectors would kill for that missing figurine or character jug to complete their collection - the super rare figure of Pavlova (HN 487, produced 1921-38) made £ 3,800 at auction in 1993, while The Village Blacksmith prototype Character jug made £ 6,000 earlier the same year. can fetch up to £ 2,000. However, the 1990s are proving to be the decade of the discerning eye. In the '70s and '80s prices rose steadily as any Doulton in sight was snapped up without too much concern for condition, restoration or production numbers. Now the collector is seeking out the really unusual and rare and paying top price for it. 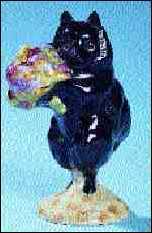 Few readers of collectors' magazines could have missed the ballyhoo in the last three years over the Beswick figure Duchess with Flowers. This was produced between 1954-67 and was not popular with collectors at the time. However, any '90s Beswick collector wanting to complete their Beatrix Potter collection of Beswick figurines needs the 'Duchess'. One minute it was worth £ 300 then a couple of months later it was being traded at fairs at £ 500, six months later it was at the £ 1,000 level. And today? Sorry, not much change from £ 2,000 - and all for a little black dog that would have cost you about 5 shillings (25p) in the swinging sixties! So what should we be eagerly investing in at the moment? The answer loud and clear has to be Royal Doulton Snowmen and Bunnykins figurines! Topping the list of incredible price rises is the Skiing Snowman, marketed in 1990 at around £ 12. Royal Doulton discovered they had a problem producing his skis (the reader has to imagine a little china snowman in goggles skiing down a mountain)! Consequently they withdrew him from production towards the end of 1991 after which collector mania took over in full force. Yes, you've guessed it; everyone wants the skier to complete their snowman collection (currently around 25 different figures). As we go to press, the skier is being retailed through a London specialist dealer at £ 700! Closely, followed by Lady Snowman produced 1987-92, at £ 250. If you have difficulty imagining snowmen skiing down mountains, how about Bunny Rabbits performing a whole variety of different tasks? Such is the mania for Doulton Bunnykins figures that in 1995 the Jester figure, in a limited edition of 1,500, sold out in just three weeks. Its asking price was £ 45 and now, a few months later, it retails at over £ 100. When it comes to the more distant past, interest in Doulton is just as ferocious. We have already talked about rare discontinued figurines and character jugs, but there is an equal enthusiasm for Kingsware, Sung, Chang, Series Ware and many other varieties of the product. Prominent among these is the artist stoneware made popular by such great Doulton names as Hannah Barlow, Frank Butler, Eliza Simmance and George Tinworth who were employed at the Lambeth factory at the end of the last century. Each production piece was worked on by hand with characteristic designs. Hannah Barlow, for example, excels as an illustrator of animals on the body of the clay, while George Tinworth is famous for his figural groups and clocks, often in allegorical form, with mice performing human tasks in comical or grotesque poses. This 'high Victorian' style is much appreciated today. A Tinworth mouse group titled The Combat was recently dug up on a Victorian rubbish tip by a collector looking for old bottles. It had obviously been thrown out as soon as the piece had become 'unfashionable' but luckily, protected by a thick crust of peat, it survived in perfect condition. The collector recognised it as an important find and brought it in to me for auction. In a specialist Doulton sale it fetched £ 1,600 plus 15% buyers premium. Not bad for a day's digging and yet another testimony to the enduring popularity of Doulton Wares. Bi-monthly magazine incorporating Collecting Beswick. In-depth features, news etc. A must for serious collectors and dealers. Subscription (6 issues pa) UK: £17.80. Overseas: £26 . Royal Doulton Figures by Desmond Eyles, Louise Irvine and Valerie Baynton. Richard Dennis Publications. £ 48. Royal Doulton Bunnykins Collectors Book by Louise Irvine. Richard Dennis Publications. £ 13. Lyle Price Guide to Doulton. Lyle Publications Ltd £ 14.95. Francis Joseph publish a series of price guides: The Doulton Figure Collectors Handbook ( £ 14.95), The Beswick Price Guide ( £ 12.95), The Character Jug Collectors Handbook ( £ 14.95).